Vices are sometimes only virtues carried to excess. ‘Tis the season of excess, and many of us are feeling the after-effects of overspending and overeating… maybe even over drinking 😉 After all, “vices are sometimes only virtues carried to excess.” Charles Dickens was a very wise man! In other words, many of us enjoyed too much of a good thing, and now it is time to forge ahead with healthier eating, more consistent exercise, and a budget. Eating more fish can be a great way of addressing both your budget and dietary concerns. Purchasing fish need not be a “budget buster.” Many inexpensive options are now available. Living in landlocked New Mexico, we don’t have access to fresh fish options. However, flash-frozen varieties are readily available. I have found membership warehouse chains such as Costco and Sam’s Club to be excellent sources of inexpensive, good-quality flash frozen fish. I purchase tilapia, catfish, and flounder on a regular basis. 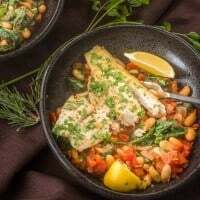 While I do splurge on tuna and sea bass occasionally (for a price 🙂 ), my weekly meal planning relies heavily on these affordable fish species. In addition to affordability and health considerations, I prefer sustainable and environmentally sound choices. Monterey Bay Aquarium Seafood Watch is an excellent resource for making well-informed selections when purchasing fish. The site includes a search engine for an extensive listing of fish species and fisheries with recommendations based on how well the fishery is managed, method of catch/farming, location, subspecies, market names, etc. 2017 update: My “go to” frozen fish choice is barramundi. For my Tuscan Fish with Cannelini Beans, Tomatoes, and Spinach, I have used tilapia, barramundi, and farm-raised catfish successfully. Any firm, mild white fish will work. This recipe comes together very quickly, making it a great choice for weeknights. If you’ve been following my blog, you know I am a firm believer in a “well-stocked pantry”, and I always have several types of canned beans on hand, including cannelini. I consider my freezer to be part of my “pantry,” and I keep the fish fillets on hand as well. I am never without good quality petite diced tomatoes. I buy the large tub of organic fresh baby spinach at Sam’s Club on a weekly basis. It keeps well in the refrigerator for a week. The balance of the ingredient list is always in my pantry, so I am “off to the races.” I can complete this dish in 30 focused minutes! “Focused” is a qualifier when I cook as I fight a losing battle with ADD at times, and, I love a glass of wine while I cook 😉 . Gathering your ingredients and equipment before beginning allows you to cook more efficiently, and makes less mess. A large sauté pan and a deeper covered skillet or dutch oven should get the job done. Sauté the garlic and onion in olive oil, add the crushed red pepper and rosemary (if using,) and stir until onions are translucent. Add the tomatoes in their juice, and the beans. Cover the pan and let the mixture simmer while you prepare the fish. To a sauté pan on medium-high heat, add the olive oil and the remaining garlic. Add the seasoned fish fillets to the pan. Watch the fish carefully as over-cooked fish is not tasty. Lift the edge of the fish fillets, and when they are golden brown, carefully turn the fillets. After turning the fillets, add spinach to the pot with the beans and tomatoes, and give it a good stir. Return the lid to the pot for an additional 1-2 minutes until spinach is wilted. My husband and I enjoy this dish with a crisp white wine such as sauvignon blanc or an un-oaked chardonnay. A light red wine like chianti or sangiovese would also be a good choice. In a very large, deep skillet with a lid or a dutch oven, heat 1 tbsp. olive oil. Add onion and 1 tsp. garlic. Saute until onion is translucent. Be careful to not burn the garlic. Add crushed red pepper and rosemary if using. Stir. Add diced tomatoes and cannelini beans. Stir. Cover the pan, and reduce heat to simmer while cooking the fish. In a large saute pan on medium-high heat, add remaining tablespoon olive oil and the remaining teaspoon of garlic. Give it a good stir. When garlic is sizzling, add fish fillets to the pan. After a couple of minutes, lift the edge of the fish. When the fish is nice and brown, and beginning to become opaque white on the top, carefully turn the fish using a spatula. 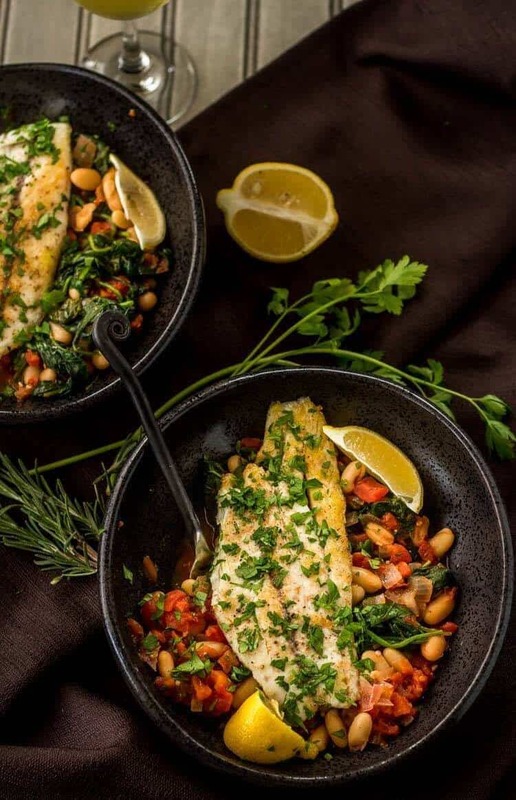 While fish cooks on the second side, add fresh spinach to the bean and tomato mixture. Give it a good stir, and replace the lid. Turn off the heat. Allow the spinach to wilt. Check for seasoning. Stir to combine. Squeeze the fresh lemon juice over the cooked fish fillets. 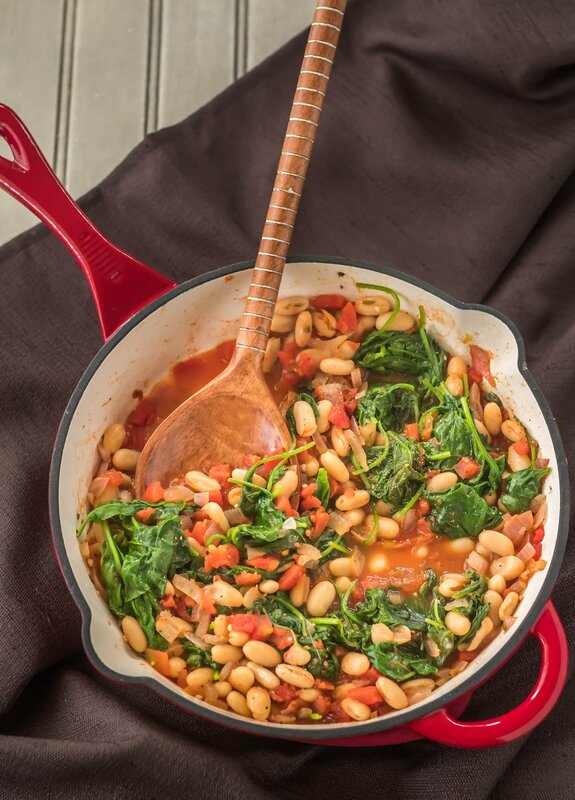 Divide the cannelini bean, tomato, spinach mixture among 4 plates or large shallow bowls. You need a little bit of a lip to confine the juices. Top each with a fish fillet, and garnish with parsley and a wedge of lemon if desired. Choose your cookware wisely. You will need a large saute pan for the fish to allow for turning. The spinach takes up a lot of space in a pan/pot prior to wilting. A dutch oven works well. 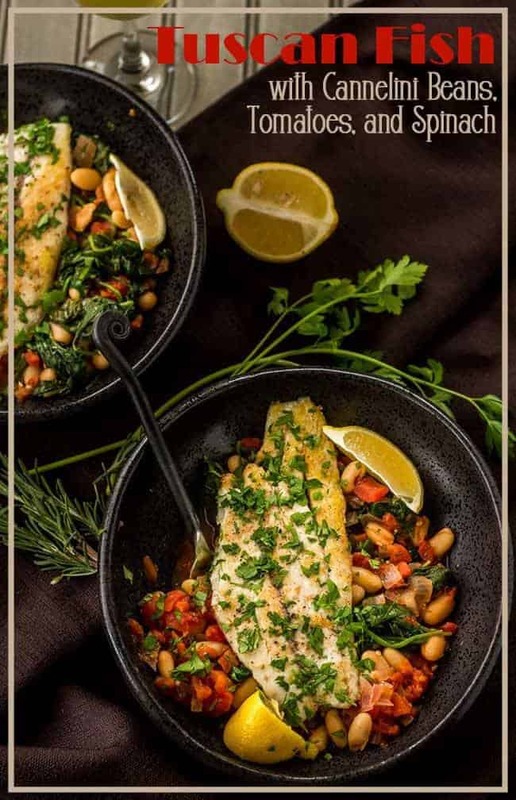 If you forgot to thaw fish in the refrigerator, you can thaw the fish quickly by placing fillets in a bowl and running cold water over it until thawed. After removing each fillet from its package, give it a good rinse and pat dry each fillet prior to cooking. You will achieve a better result. Gathering ingredients and equipment beforehand will save time. Use fresh spinach. Wilted fresh spinach makes this dish special. Frozen spinach is not a good substitute. Minced garlic in a jar is a great time-saver for weeknight cooking. Keep cannelini beans, petite diced tomatoes, minced garlic, crushed red pepper, and olive oil in your pantry. Keep frozen fish fillets in your freezer, and fresh spinach in your refrigerator. I keep wooden spoons/spatulas in a container next to the stove for sauteing. This looks so good!! I rarely cook fish, but seriously I don's know why.. It is so easy to make, and you get dishes looking like this!! I think a lot of people had a bad experience with improperly cooked or spoiled fish, and they just can't go back to it... I would rather have a fish dish than just about anything else! Quick, easy, delicious, nutritious. Great recipe! I think this qualifies as a "go to" recipe? Well this is going into our regular dinner rotation. After cleaning up our dishes I immediately texted this recipes to all my friends and family. My husband and I loved it (he wants it again tomorrow) even my picky 7 year old took his first bite of fish based off the delicious aroma that filled my kitchen. 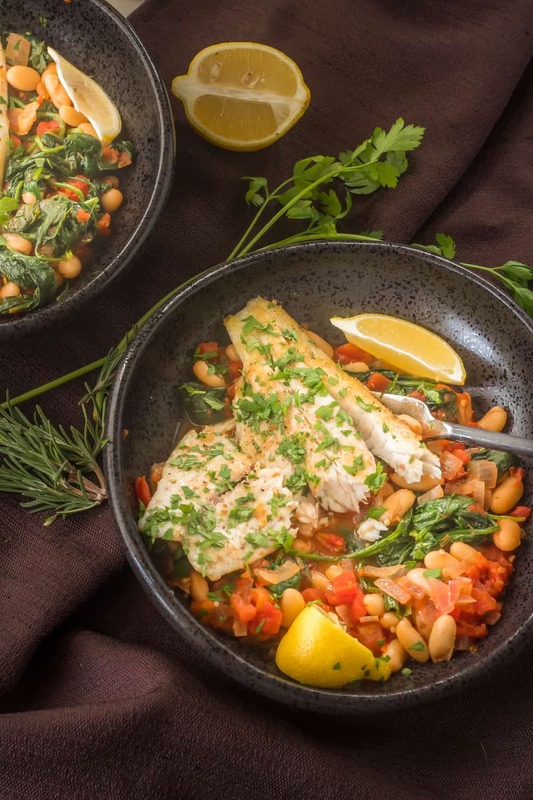 It reminds me of a Marocan fish dish I make but this blows it out of the water! So excited to have found your site- i can't wait to try more of your recipes!! What's your favorite?? Thank you for taking the time to send feedback Jill! You've made my day :-) I'm so glad you liked my Tuscan fish dish!